Are Pepperidge Farm’s Pink Princess Goldfish Crackers Sexist? In 2012, Reel Girl wrote about the glaring gender inequalities featured on Pepperidge Farm Goldfish Cracker packaging. Cut to present-day, and now Reel Girl notes that Pepperidge Farm has reached a new low with their pink princess goldfish crackers, currently available at Target. If Reel Girl and Twitter folks are any indication, pink goldfish crackers aren’t just unnecessary they’re pretty darn sexist too. Like with most pink vs. every other color imaginable debates, not everyone hates the new crackers simply because they’re pink. In fact, some parents think the princess Goldfish are a festive idea. Frankly, I’m a bit irked by the debate at all. When Rainbow colored Goldfish came out and brown colored chocolate Goldfish arrived, I don’t remember one debate about the colors being “too boyish,” but release pink crackers and yup, people notice. Probably because pink may just be the most hated color of the decade. Or scratch that, in reality, pink is hated if girls like it. As Reel Girl notes of this tweet by one mama whose son wanted the pink crackers, “I love that her son wanted them.” So once again, boys who like pink are open-minded and awesome but girls who like pink are mindless princesses? This concept is beyond frustrating. That said, there’s really no good reason to buy Goldfish, pink or otherwise. Goldfish aren’t an organic snack, and although they are now made with natural colors (at least in Canada) instead of toxic food dyes, there’s still plenty of junk in Goldfish your kid doesn’t need. For example, Goldfish aren’t GMO-free and as Food Babe points out, Goldfish “are nothing more than refined white flour colored with annatto, made with GMO oils and a certain special ingredient called “autolyzed yeast” that is actually a hidden form of MSG.” You’re better off making homemade organic cheese crackers or purchasing an organic snack for your kiddos. Would you buy pink Goldfish for your kids? Let us know in the comments. I would buy them. Get over it. They are crackers. When you have sooooo much time on your hands you are worried about crackers instead of gas prices, social security ending, bullying, drugs and the general lack of respect for our country and its people you need a freaking priority check. Get real. 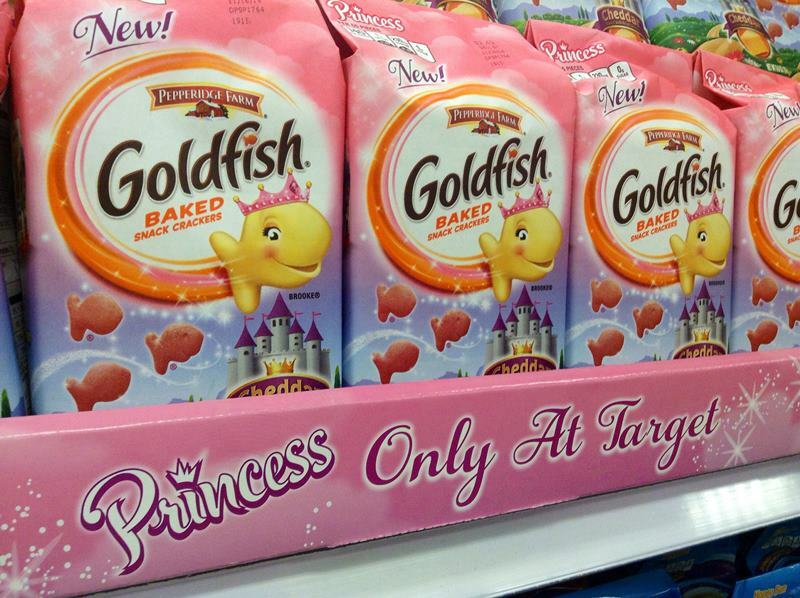 Are Pepperidge Farm's Pink Princess Goldfish Crackers Sexist? In 2012, Reel Girl wrote about the glaring gender inequalities featured on Pepperidge Farm Goldfish Cracker packaging. Cut to present-day, and now Reel Girl notes that Pepperidge Farm has reached a new low with their pink princess goldfish crackers, currently available at Target. If Reel Girl and Twitter folks are any indication, pink goldfish crackers aren't just unnecessary they're pretty darn sexist too. Like with most pink vs. every other color imaginable debates,�not everyone hates the new crackers simply because they're pink. In fact,�some�parents think the princess�Goldfish are a festive idea.